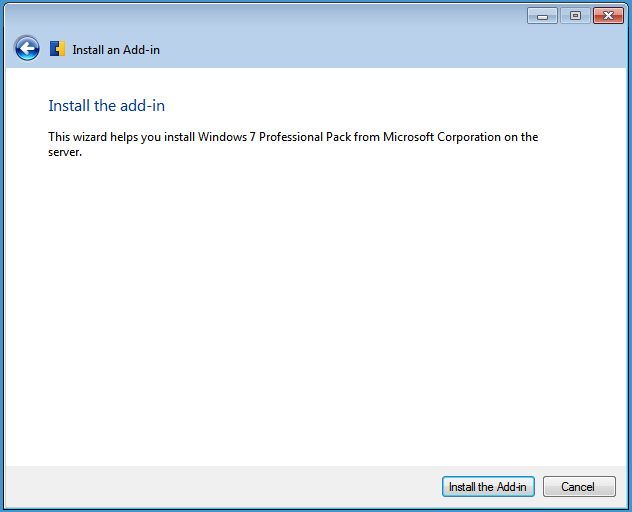 In my last post i talked about the Windows 7 Pro Pack, how to install it and how to use the wizard to configure it. I also touched on the way the W7PP is targeted just to computers running Windows 7. I wanted to cover here a bit more detail on the WMI Filter itself, (which is very simple) and also how to extend the functionality of the W7PP to other client operating systems. I did make a hilarious reference to Jeff Goldblum’s Jurassic Park character, saying just because we can, does it mean we should? Well, i think in this case it does. We can extend Folder Redirection and management of Windows Update, Windows Firewall and Windows Defender to XP and Vista and we should. Folder redirection.. not so much. Now, those of you who are seasoned SBS Admins, will either A already know this or B know this already. With SBS it is best, not to stray to far from the wizard. The wizard likes things done his own way, and tends to get grumpy when it doesn’t. Here we have an example of a grumpy wizard. We all know what damage a grumpy wizard can do. 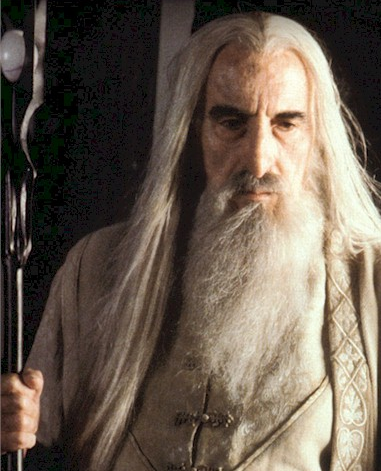 Lay waste to middle earth… but i digress. 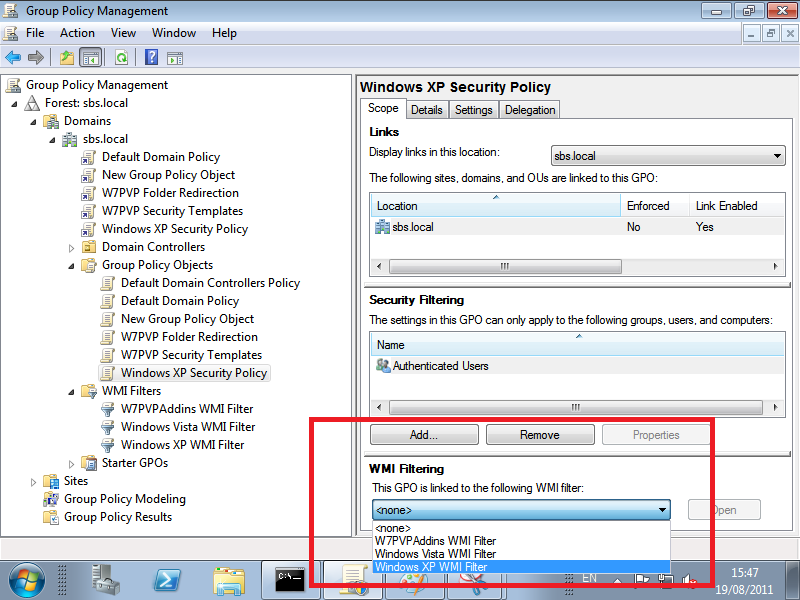 So rather than do what a lot of people will do, which is de-select the WMI filter, we can just create new GPO’s that only apply to XP or Vista. This gives us more flexibility, it also doesn’t break the W7PP. 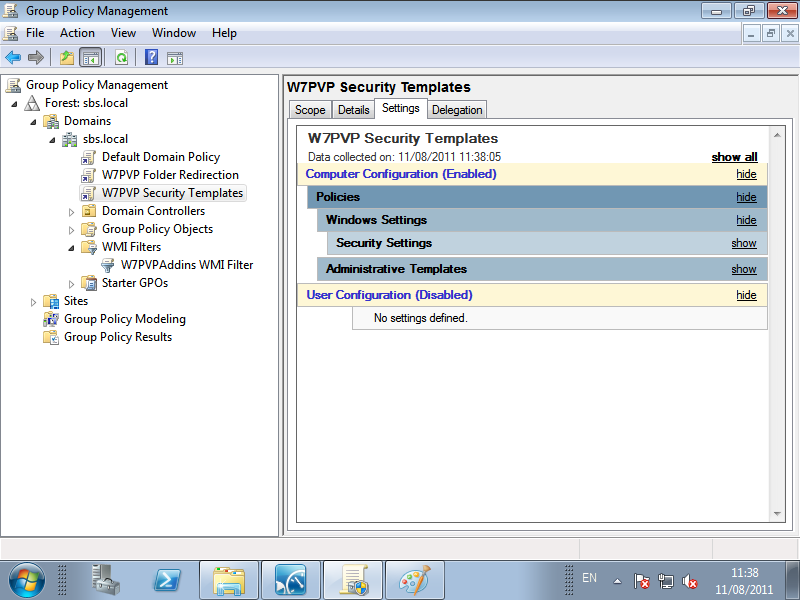 First, let’s take a look at the W7PP WMI Filter. 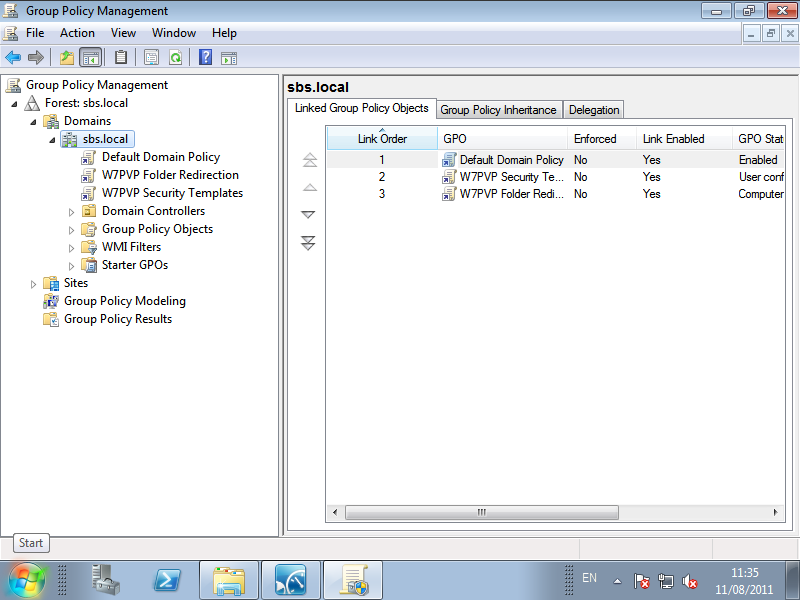 If you open up the Group Policy Management Console (From Administrative Tools) You will see a section for WMI Filters. 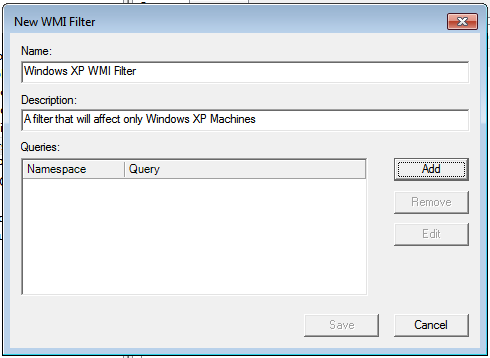 Expanding WMI Filters, you will see the filters you have defined. We only have one so far. Above highlighted in blue is the WMI Query used to target machines running Windows 7. You can see that the filter is made up of a namespace, and query. The name space is based on CIMv2, which appears to be a standard, but i can’t tell you what the root part is for. We know that root is the beginning, but apart from that I’m lost! If anyone can explain it to me feel free. So let’s just say we are looking at the root of the CIMv2 (by the way CIM is Common Information Model) There are a lot of namespaces you can choose to Query and with that you can find out and filter based on a lot of different things. For example there is a root\CIMv2\power namespace and a root\CIMv2\Hardware namespace. The query is used to pinpoint certain attributes a computer may or may not have. The first portion is straight forward enough, targeting the potential OS Attributes of the PC. Next we choose to filter based on OS version and Product type. OS Version is simply the version of Windows that is running, and product type denotes whether it is a Client OS (Windows XP Vista or 7) or a Server, and if it is a server, is it a Domain Controller or member server. I’ll be honest and say i am no expert in WMI but, i wanted to cover a little overview on what it does and how it works. There is a really great post here which will explain things better than i can. So we now know a little about WMI and how it works, now we can go ahead and build some WMI Filters to target Windows XP and Windows Vista. From the WMI Filters tree item, right click and click New. 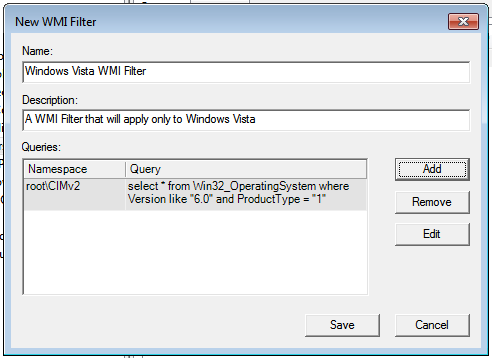 A window opens and you can name your new WMI Filter, and enter a description. Now we can click on Add, to type in our Query. 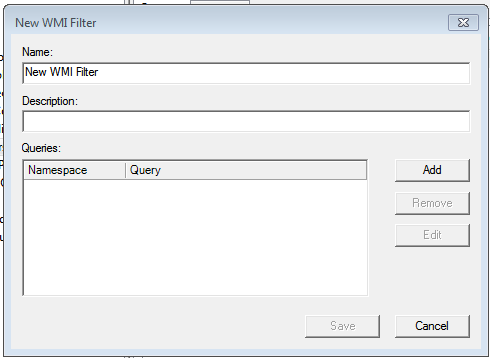 Click on OK to close the WMI Query box, then choose Save to save your new filter. 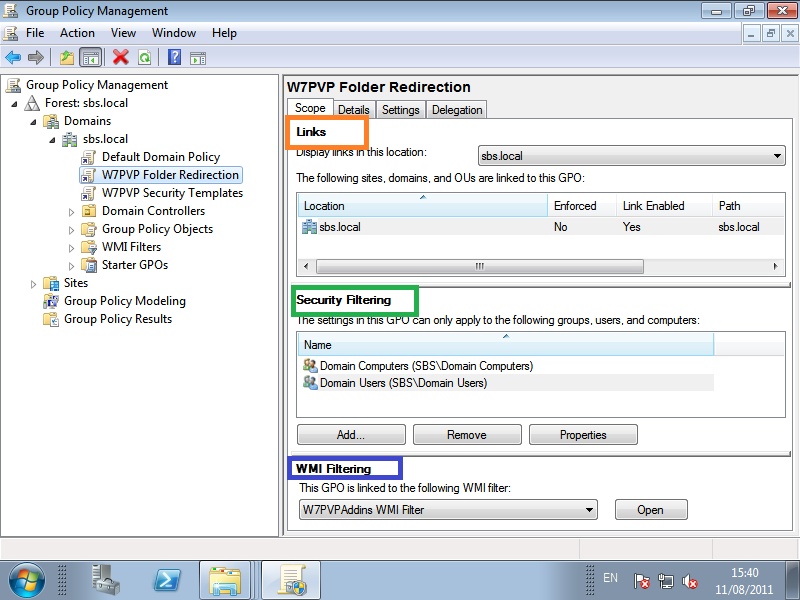 Click Save and you will be returned back to the GPMC, WMI Filters section. 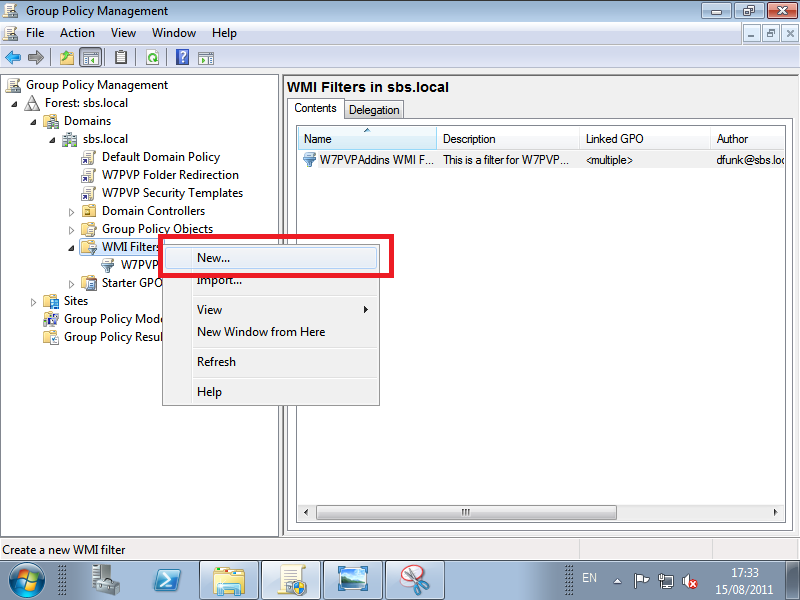 You will see your two new WMI Filters shown in the details pane. Now to put these into action. We need to create new GPO’s (Group Policy Objects) to control settings on our computers. There a number of ways to do this, but, we will just go for the most straight forward. Enter a name for your GPO, you can ignore ‘starter GPO’ click OK.
You will see your new GPO appear. If you click your new GPO, you will see it show up in the details pane. 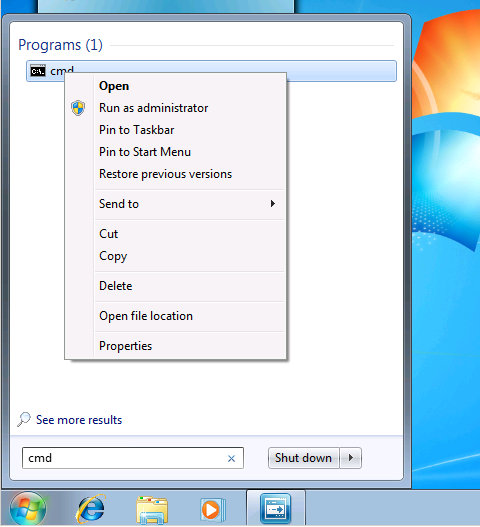 At the bottom on you can choose to link this to your WMI Filter using the drop down menu. A message will pop up saying, are you sure? yes we are sure, we wouldn’t be doing it otherwise would we? Now we can edit our GPO. Right click the GPO and choose Edit. The Group Policy Management Editor opens. 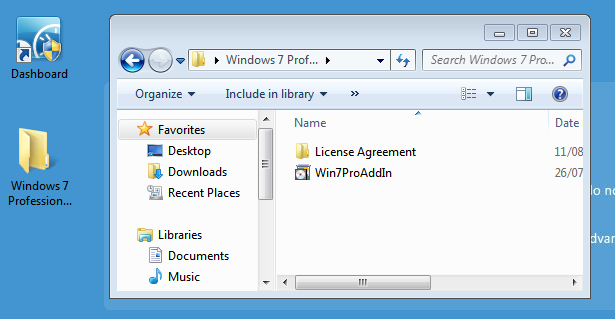 Under Windows Components, scroll down to Windows Update. 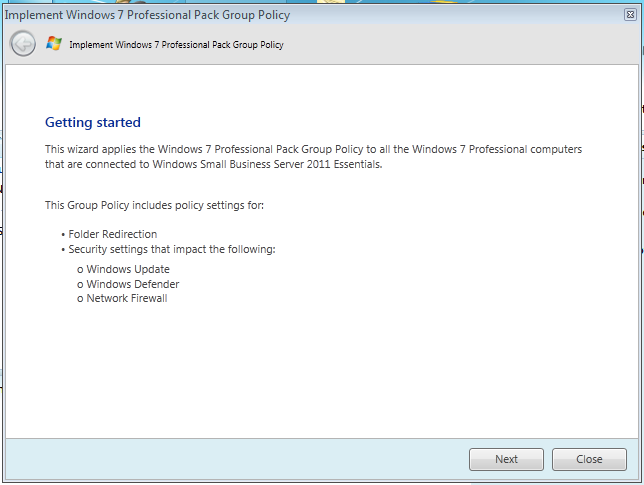 In the details pane, you will see all the policy settings available. Double click on the first setting. You can use the ‘next setting’ button to scroll through the settings without closing the window and reopening it. 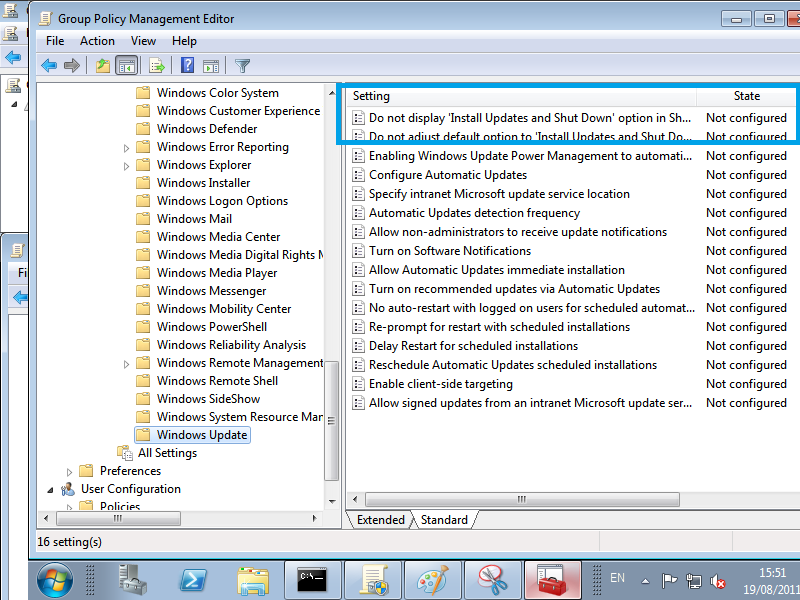 Scroll through until you get to ‘Enabling Windows Update Power Management..’ You’ll notice the highlighted text, Supported on: Windows Vista, this means this policy is only available on Windows Vista or newer computers, and older OS’s will ignore the setting. Click ‘Enabled’ then under the options, use the drop down menu and select option 4. 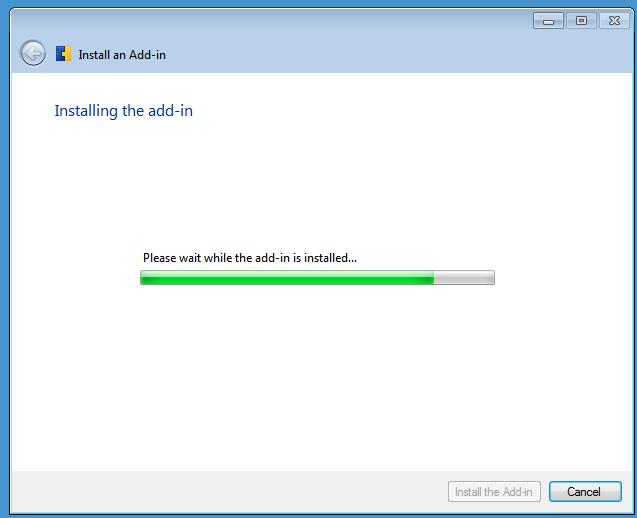 Auto Download and Schedule the install. Click on OK to close the Settings window. What we have just set will tell any Windows XP Clients to download updates anytime they are available but schedule the install for 3am every day of the week. You will need to manage the power options of your XP Computers to make sure they are on at that time. 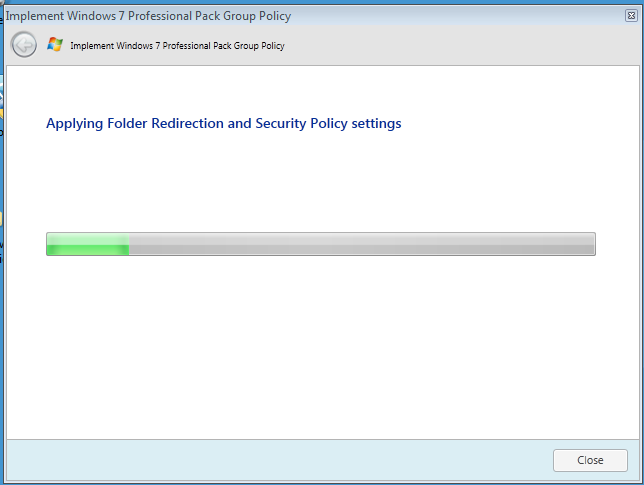 You can do this locally on the PC or you can use Group Policy Preferences, which i may cover in a future post. Or you can look at this. 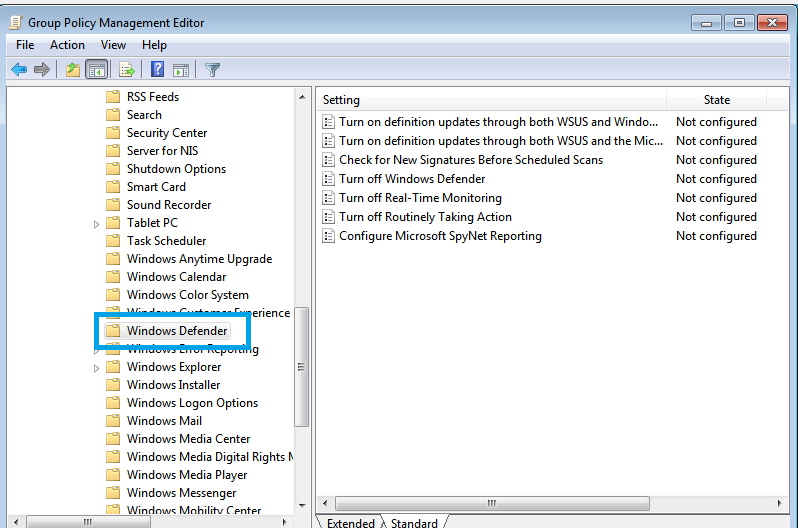 In the tree pane, scroll up to find Windows Defender. Double click on ‘Check for New Signatures before Scheduled Scans..’ And set this to Enabled. 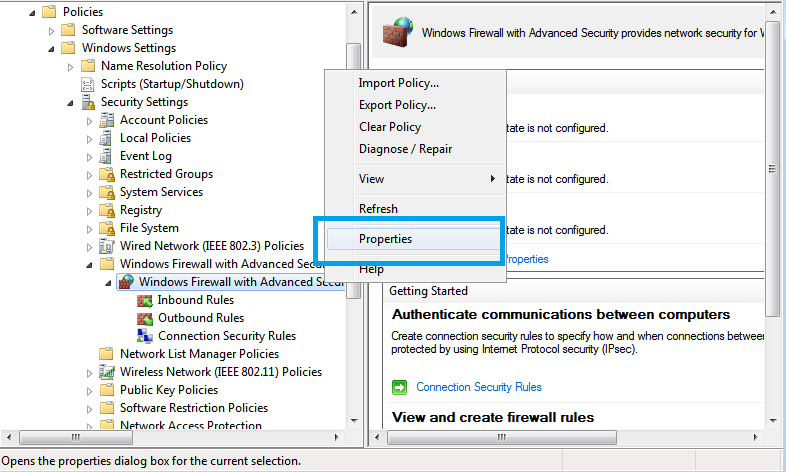 Use the next setting button to go through to ‘Configure Microsoft SpyNet Reporting’ Click to enable the policy setting and use the drop down to set at Advanced. A description is available of the levels in the help section to the right. 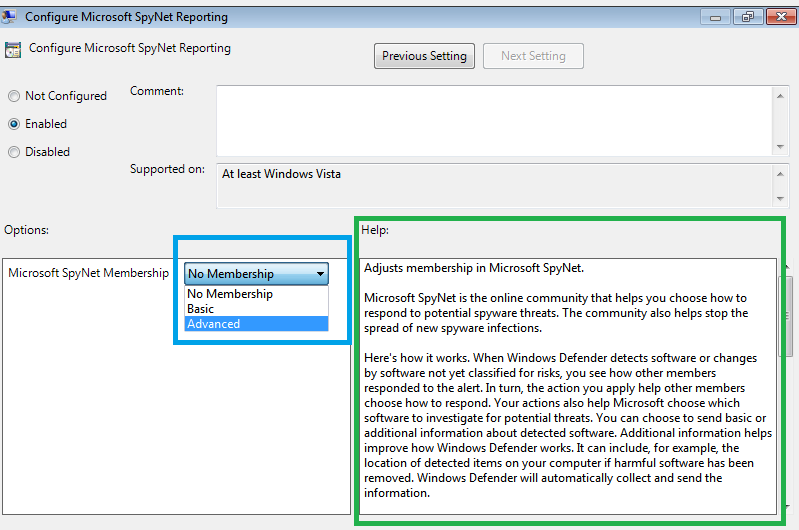 So we have told Windows Defender to look for new definitions before a scan, and also to join Spynet with Advanced membership. You can now close the settings window, and we will move on to Windows Firewall. Computer Configuration > Administrative Templates > Network > Network Connections. 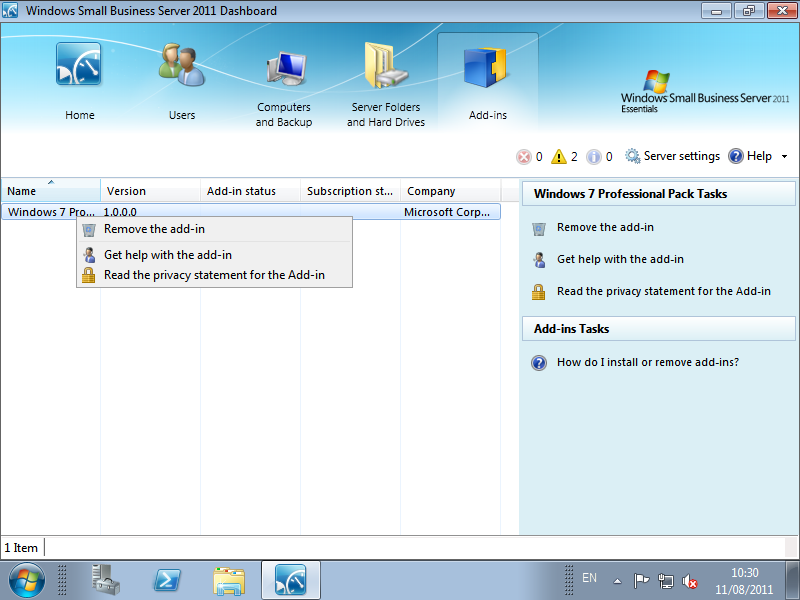 Select the Domain Profile folder, and in the details pane, double click the first option. Scroll through to ‘Protect All network Connections’ and set to enabled. 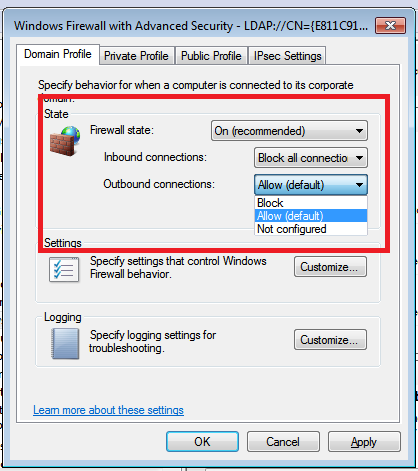 The localsubnet string tells windows firewall that anything matching the same subnet that client pc is on is allowed to pass through the firewall. 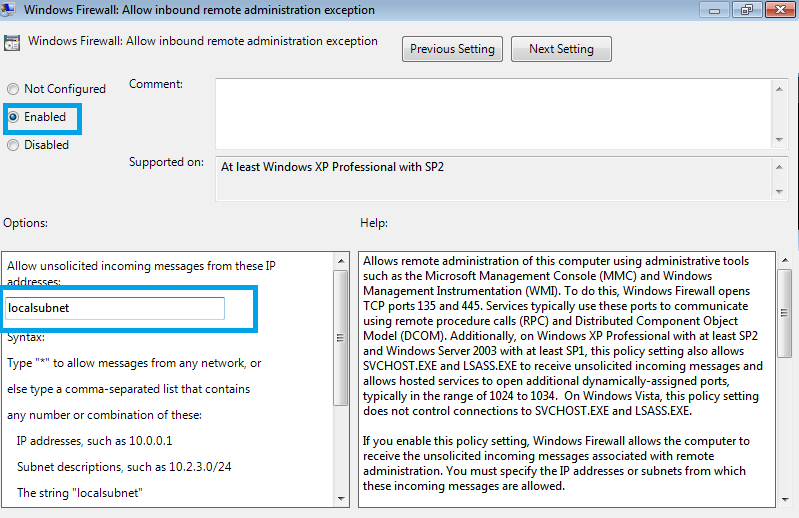 Move onto ‘Allow ICMP exceptions’ set to enabled and ‘Allow inbound echo request’ This will allow us to ping our computers. 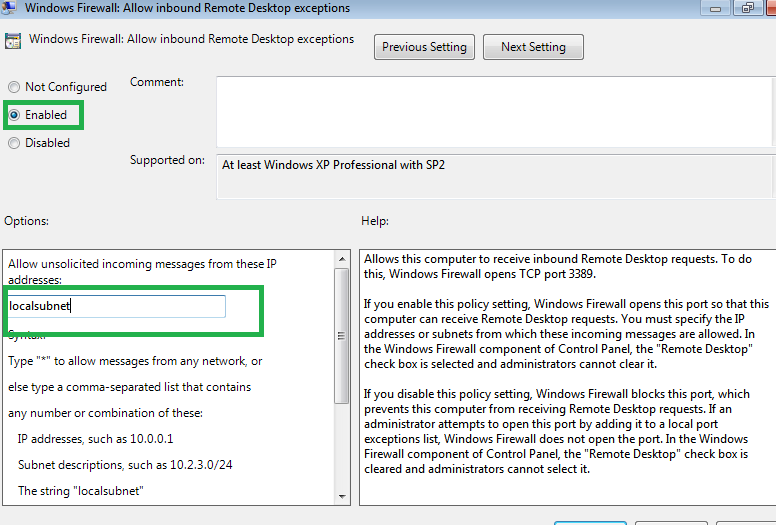 Next we will allow the Remote Administration exception and the Remote Desktop Exception. 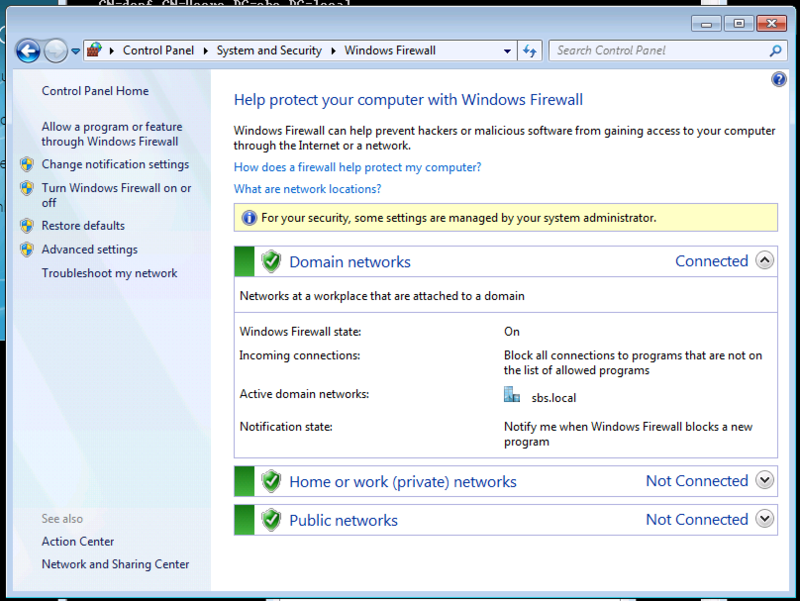 The Windows firewall settings we have set here will apply only when the computer is on the domain network. 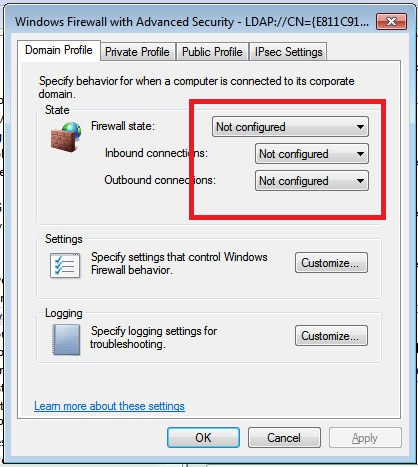 If you have mobile computers and you want to enable the firewall when they are out of the office, simply go to the Standard Profile folder, set the policy to Protect All Connections, and then define the exceptions you wish. For Windows Vista computers we can set exactly the same settings as above except for the Windows Firewall which is configured differently. Right click Windows Firewall with Advanced Security and go to properties. 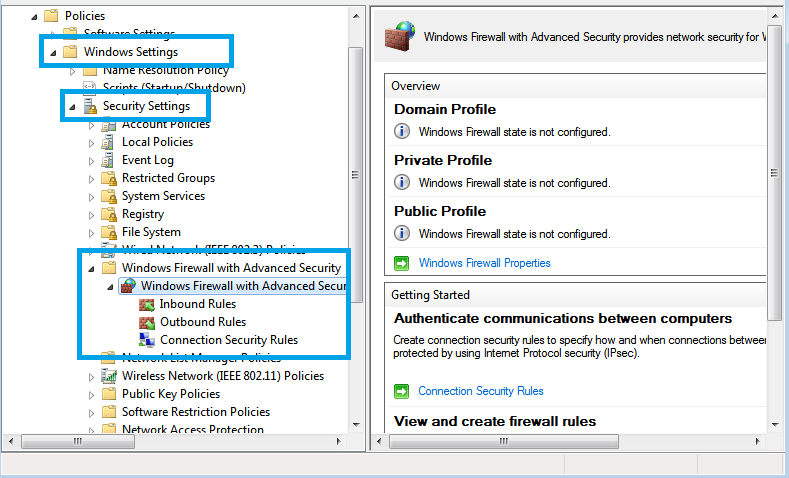 What will open up is the settings page where you define the firewall state for Domain, Public and Private networks. You will probably want to set the options for Public and Private networks as well. 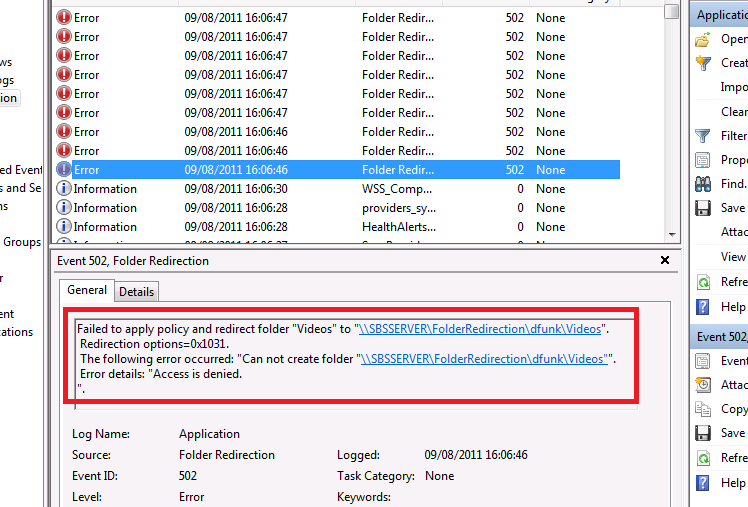 These will apply when the Vista machine is not on the Domain network, so usually should be more restrictive. In the details pane right click and click New Rule. A wizard starts to build your new rule. We want to use a predefined type of rule (exception). 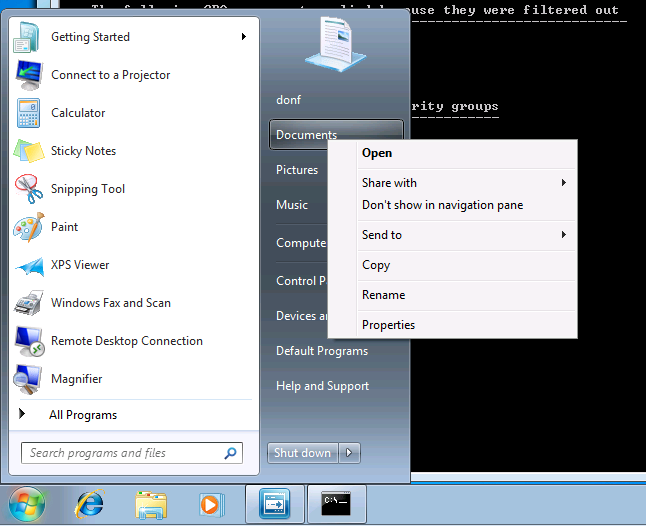 Select that and then from the drop down box choose File and Printer sharing. Click next. You will be shown all the exceptions this predefined rule will add. Click next. You will be asked what action to take when a connection matches this rule. We want to allow. Click finish. You are taken back to the details pane and shown the new rules you have added. 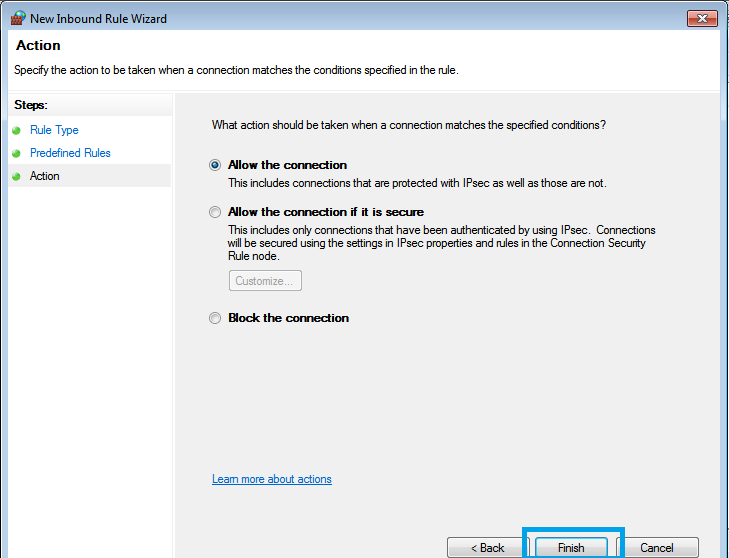 You can now repeat this process and on the predefined rules page, select, Remote Administration, and then again, Remote Desktop. You will finish up with a set of Inbound Rules like this.. The setting is ‘’Do not allow Exceptions’ We must make sure this is set to ‘Not Configured’ otherwise the exceptions we defined above will not take effect. 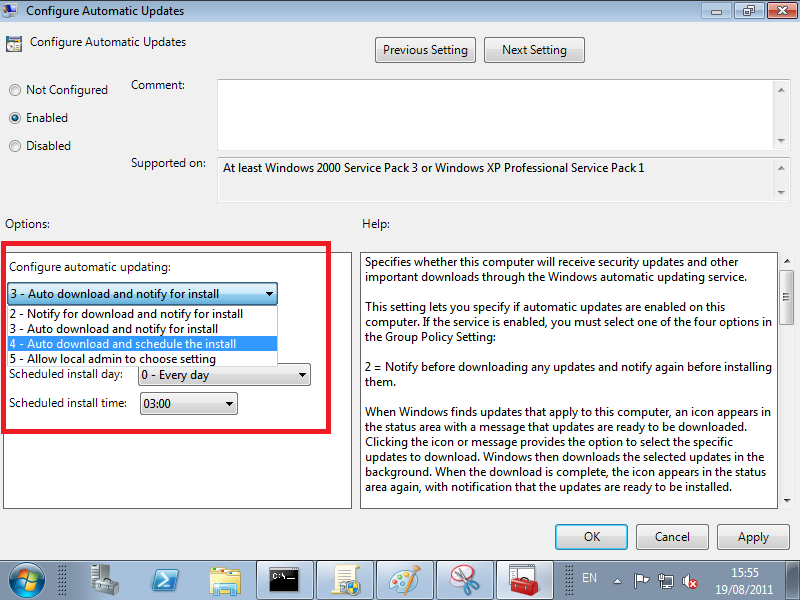 Having followed these steps you will have created 2 WMI filters, one to match Windows XP Clients, and one to match Windows Vista. You will also have added 2 new GPO’s to control Windows Update, Windows Defender and the Windows Firewall. 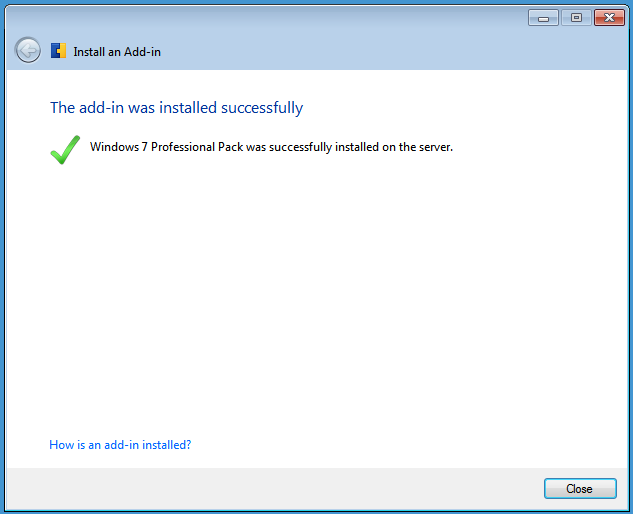 The Windows 7 Professional Pack Add-in (Forever after called W7PP or Pro Pack) is a Free Add-in for SBS Essentials that Microsoft have developed and will be releasing on the 12th of August. Whilst most Add-ins will work across the Suite of Colorado Products (SBS Essentials, WHS 2011 and Windows Storage Server 2008 R2 Essentials, try saying that after a few drinks) this one is specifically for SBS Essentials. 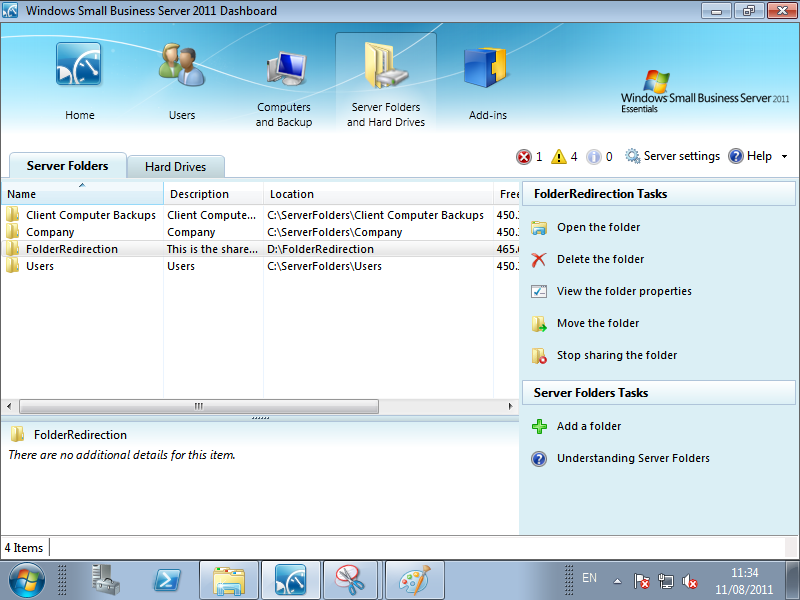 The Add-In simplifies configuration of Folder Redirection, Windows Firewall Settings and also Windows Update & Defender settings for client computers running Windows 7 Professional. 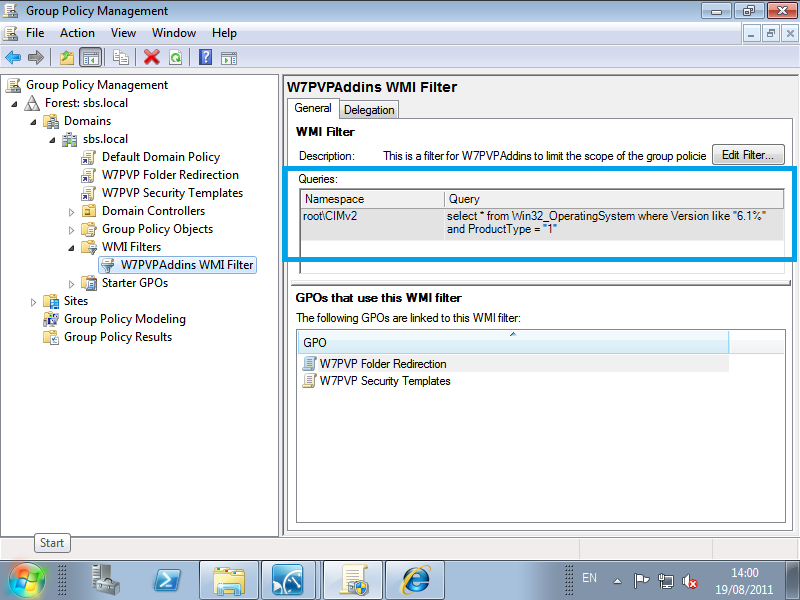 It does this by creating Group Policy Objects (GPO) by means of a Wizard, and targets Windows 7 Pro by means of a WMI filter, more on WMI Filters here. Now, for the more experienced Administrator, that obviously means it is trivial to retarget these GPO’s to apply to any Domain Joined Client, however do keep in mind the Target Audience or market for SBS Essentials is that of the DIY’er Admin, someone who doesn’t know one end of a GPO from an OPG. And just because we can doesn’t mean we should right? We’ve all seen Jurassic Park. Anyway, i am going to cover the installation of the W7PP and detail the changes it makes, and what you can expect to see on your client machine, and also a little bit of troubleshooting as well. 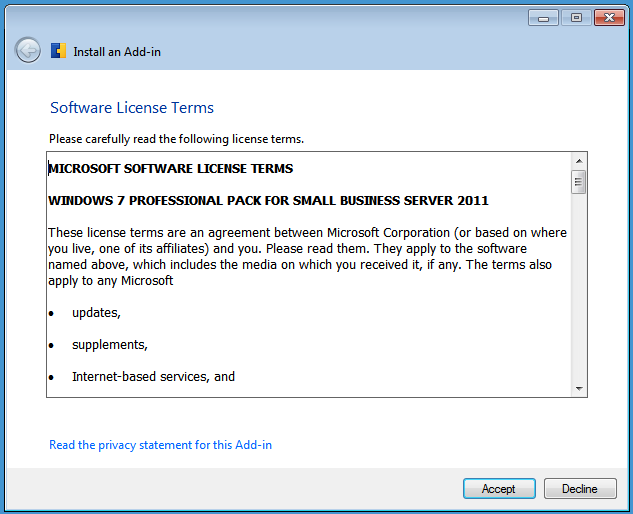 Double click the file to start the installation, and the first screen is the License Agreement. The next page is a simple choice, Install the Add-in or Cancel. So let’s switch to the Dashboard now and see what has happened. Go to the Add-ins tab, and you’ll see the W7PP. You can’t really do much here apart from Admire a job well done to get this installed. You can of course undo your handy work by uninstalling (remove) the add-in. Since this is all about getting it working i am not covering the uninstall. If we move along the tabs to the left, and go to Server Folders and Hard Drives, we can see no changes on this tab, no folders have been added. Keep moving left, and onto the Computers and Backup tab. 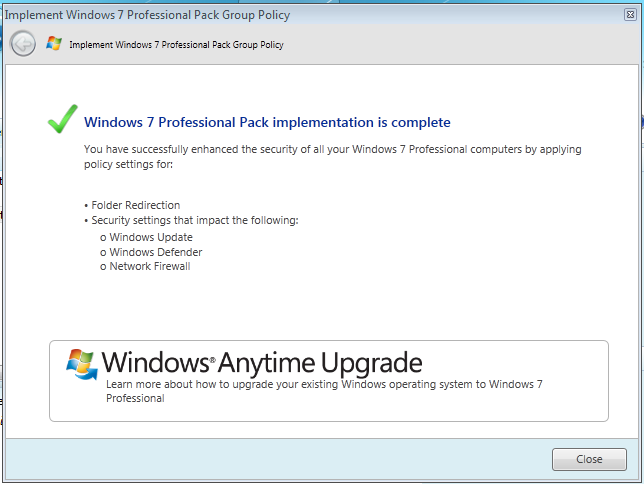 On the right hand side we have a new option, Implement The Windows 7 Professional Pack. Just installing this beast is not enough, we have to go all the way and IMPLEMENT! So let’s click on the Implement W7PP link. On the first page, we can read a little overview of what the implementation wizard will be doing. Click Next. 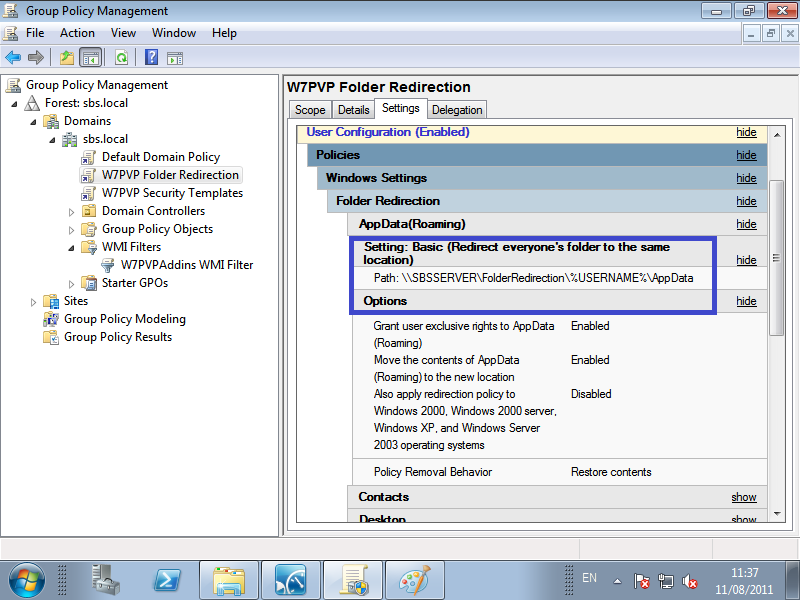 Enable Folder Redirection Group Policy. On this page we have the choice to choose whether to use Folder Redirection or not, and the choice of which folders to redirect. For example, you may not want to redirect someone’s My Music folder, and have 40gb worth of Abba tracks clogging up your new server. On the other hand you might like Abba, in that case its probably Ok. You can click to ‘Select All’ or cherry pick which ones you want to have redirected. Click Next When you are ready. 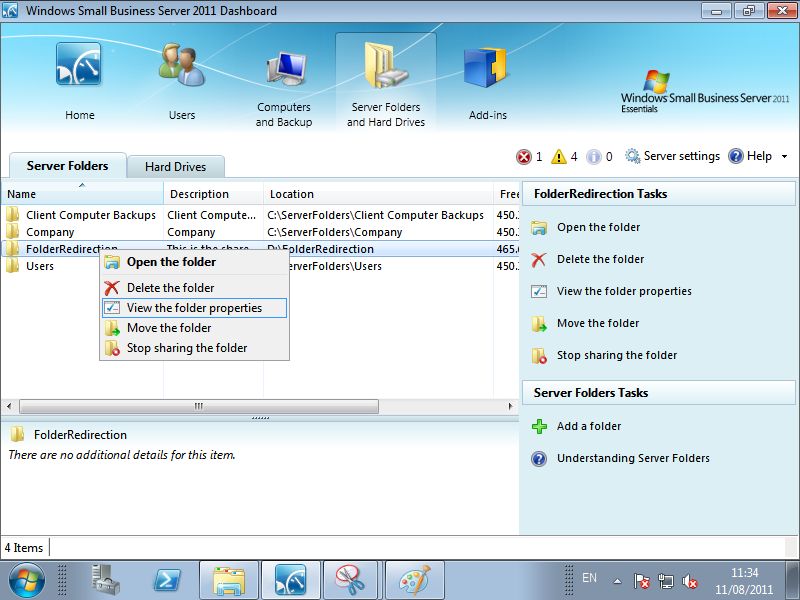 Folder Redirection allows a client computer to store data files and folders on a network share. The process is invisible to users. It is a way to make sure that all users documents and files are stored on the server, whether they save them to their ‘desktop’ folder or their ‘documents’ or in the company data share. It can also make it easier for users who move between computers, but when you don’t want the PITA that is Roaming Profiles. 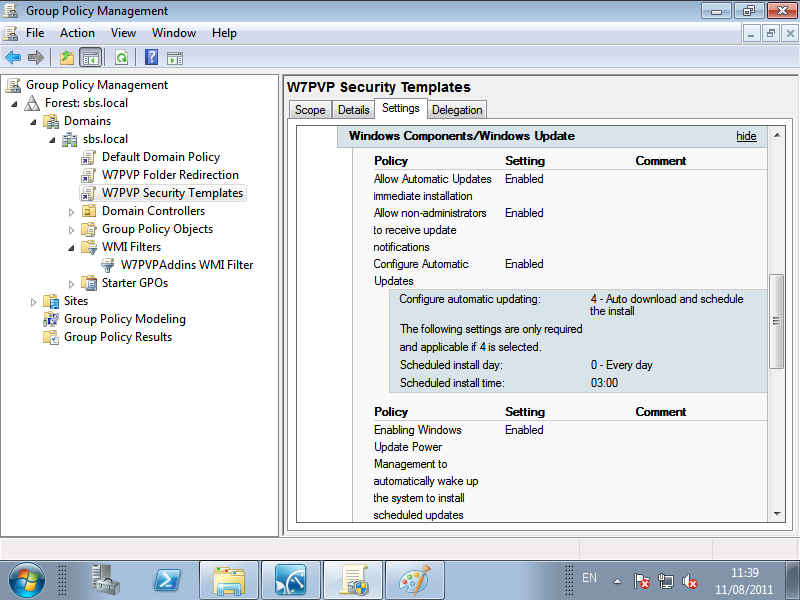 Enable Security Policy Settings. 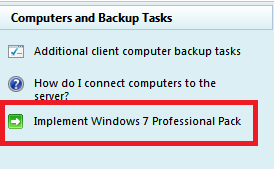 Here we can choose if we want to let the W7PP control our Windows Update, Firewall and Defender settings. The default is to have all 3 selected. Click Next when you are ready. 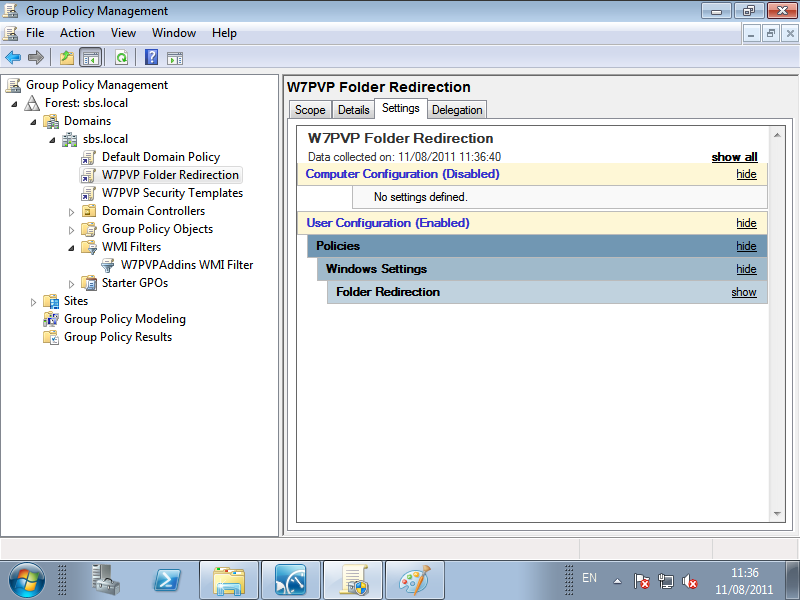 The wizard will now run through and setup your policies and also add the folder to host the redirected folders. With any luck you will see a green tick. Green means good. So, let’s go back to the Dashboard and back to the Server Folders and Hard Drives tab, we can see we now have a new Shared Folder created. FolderRedirection, this shared is located in your D:\ drive, and as you will see in the troubleshooting later on, its quite picky about that D:\. If we right click the folder, and go to ‘View the Folder Properties’ we can have a look at the default settings. On the General Tab, we have the name and description fields, a size total for the folder and a link to open the folder itself. On the Sharing tab we can see the level of access our Users have to this folder. NB. Don’t me tempted to change this – all will become clear later on. If you are not familiar with the GPMC or GPO’s in general, i would strongly advise you not to play around with it. 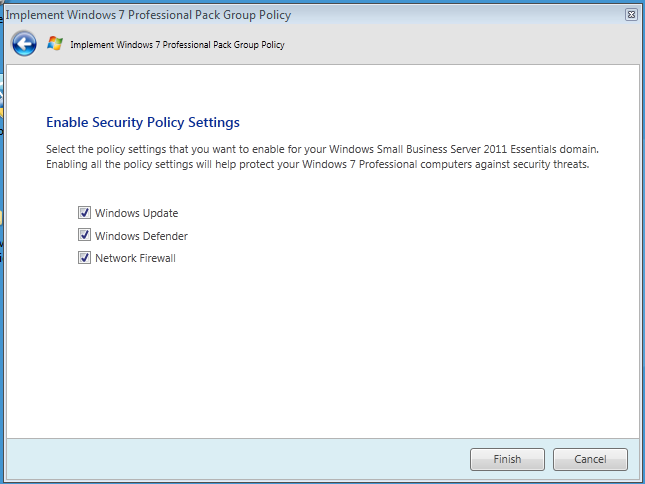 Group Policy is extremely powerful and can be used to good effect to create safe, secure, computing environments. It can also be used to lock yourself out of your own network if you click the wrong thing. Be Warned! If you expand, Forest, Domains, and finally yourdomain.local you will see a Tree structure that Mirrors what you would see in Active Directory Users and Computers (ADUC) Only this time you can see the GPO’s applied in the tree. 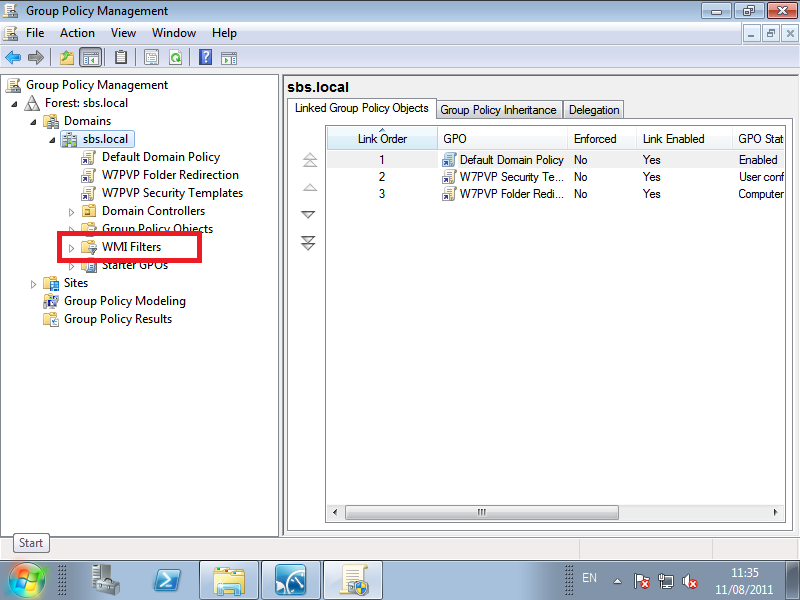 All Domains have a Default Domain Policy, even if you are experienced with GPO’s my advice is not to change the Default Domain Policy at all if you can avoid it. So let’s ignore that. You can see now we have 2 policies created by the Implementation Wizard. No, i don’t know what the V in PVP stands for. 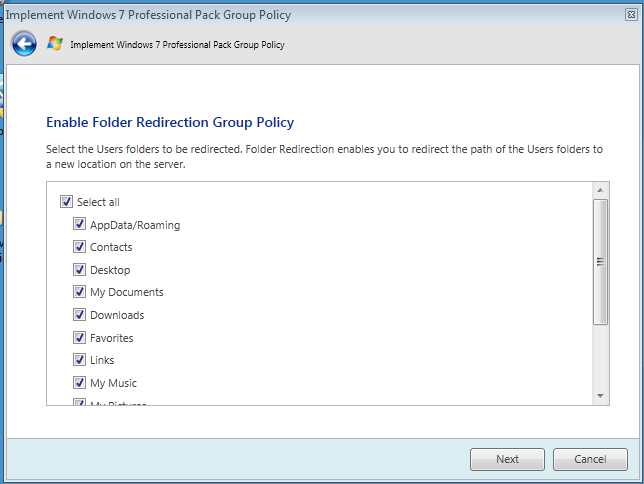 Left click on on the Folder Redirection Policy, and the details pane on the left will change to show you more specific info on this policy. This is a warning, telling you if you make changes to the GPO – they will affect anything the GPO is currently linked to. So be careful. You can click OK here. 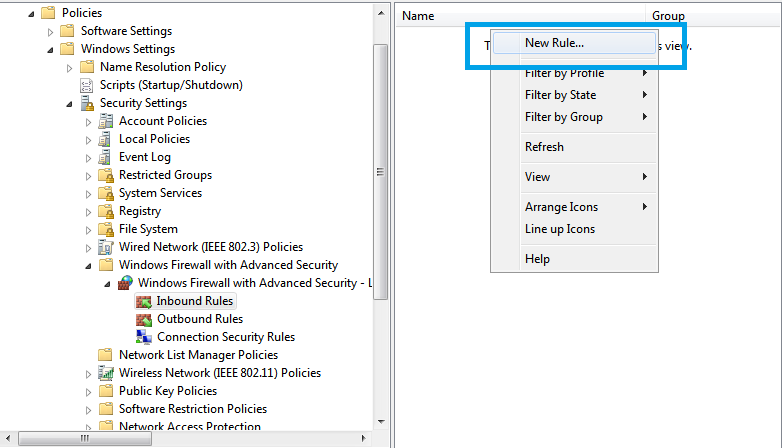 Under Links, you can see where the policy has been Linked, Under Security Filtering, you can see which Groups or Accounts the Policy will affect (apply to) and WMI Filtering shows if any WMI filters have been applied. 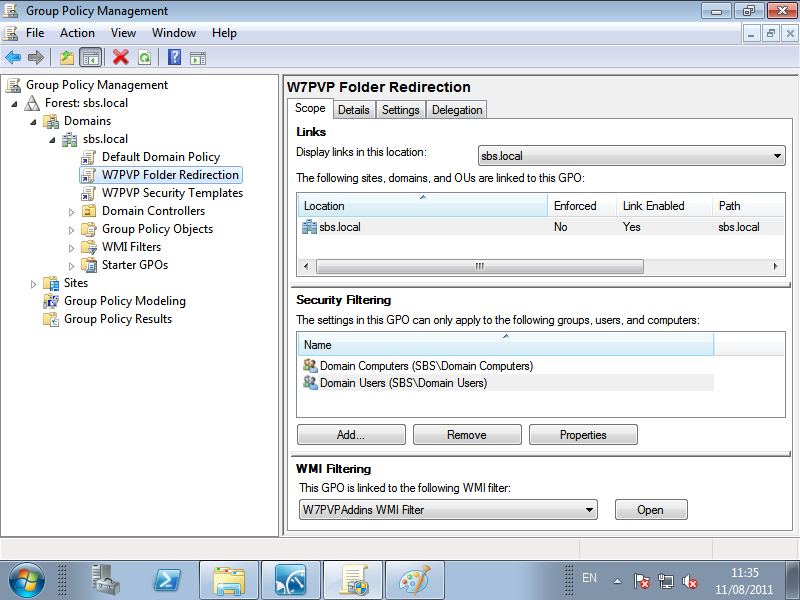 WMI Filters and GPO’s are really powerful. 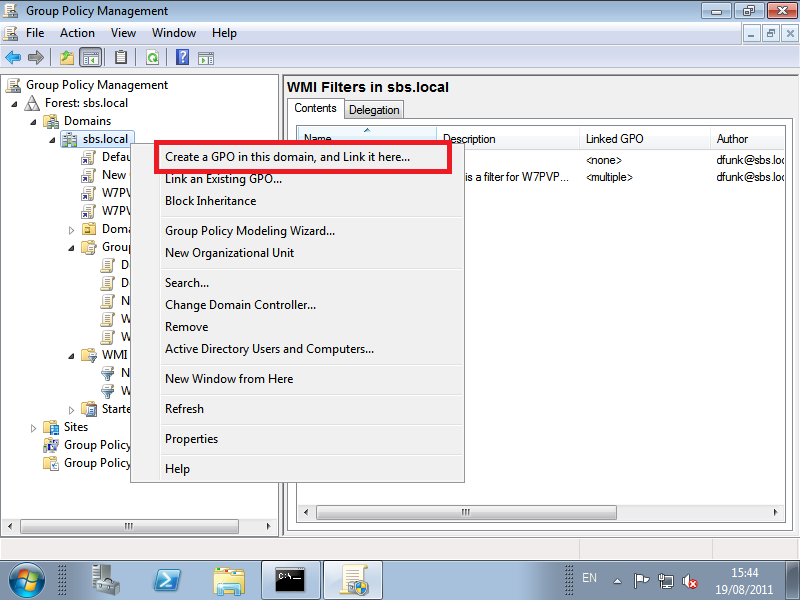 For example, a normal GPO without a WMI Filter will apply to any object below where it has been linked. That is generally a good thing, but, if we wanted to change a setting on only a particular . group of computers, lets say computers running Office 2010, or if computers have a hard drive of X GB’s then a WMI filter can do that for us. 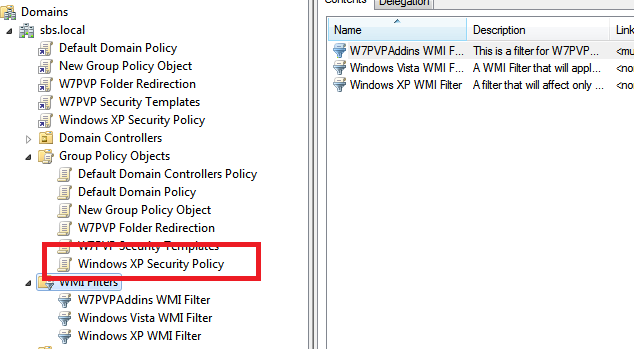 When the policy is applied, WMI will query the computer for the settings defined in your Filter, and if it matches then the policy will be applied. WMI in itself is a massive topic and way way way beyond what we are talking about here, and ill follow up with a separate post about the WMI Filter used with the W7PP. So moving on, we will ignore the Details tab, as this just shows us some info you will not need to worry about, and also the Delegation tab is for advanced targeting and security settings, which you will not need to use. The Settings tab is the main one, and this shows us which settings have been set, and what the values are. As you can see, nothing has been defined under ‘Computer Configuration’. GPO’s are split into two sections, Computer Configuration and User Configuration. Pretty self explanatory, but settings defined under Computer Configuration apply to a Computer. Settings for Users apply to Users, regardless of which computer in the domain the user logs into. 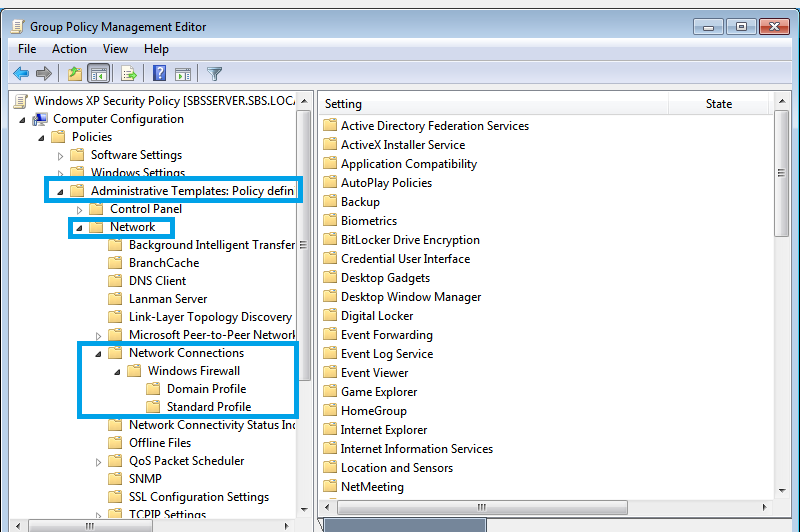 User configuration will usually override Computer Configuration, but again GPO’s are a massive subject so you can do more research on Group Policy here. Drill down under Folder Redirection, and you can see each folder that can be configured. Clicking on Show on any of these folders will display the settings that have been chosen. Each Folders Settings are split in two, You have a Path setting, and then an Options setting. 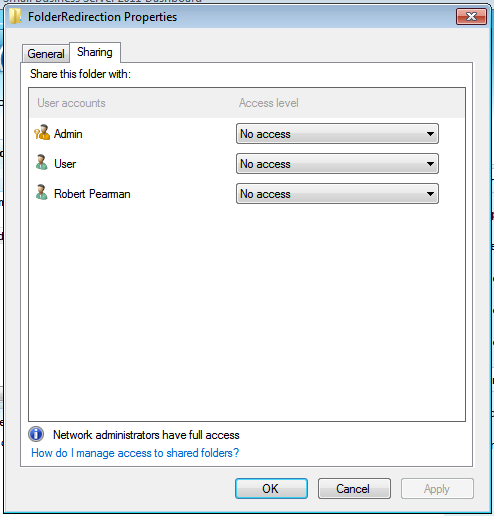 %username% is a path Variable, and this tells the Client machine to create a folder under the path, using the users username. The options are quite straight forward. 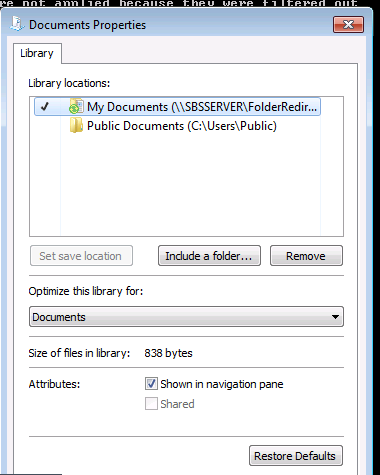 Move the Contents of the Folder – Means if you have an existing local folder, then its contents will be moved over to the server. Also, Apply redirection Policy to Win 2000…. Means do we want to use this policy along with Older OS’s. There are several considerations to make when you use this setting, which are beyond this post because this Add-in is only for Windows 7! but you can find a great resource here. 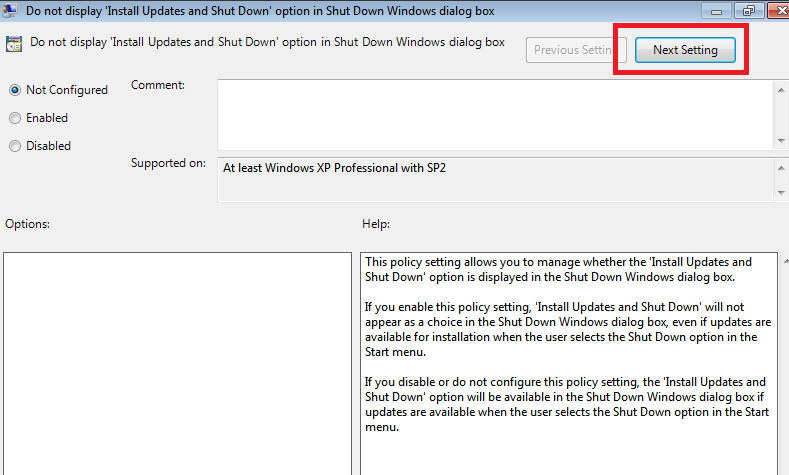 Under Policy Removal, there are also some straight forward settings, for what to do when the policy is removed. Do we want to Leave the contents of the folder in place, or move it back to the local computer. Moving straight on to the settings of this policy we can see we have settings defined under, Windows Settings, and Administrative Templates. The Windows 7 Firewall settings are configured under ‘Windows Settings’ and ‘Administrative Templates’ and the Windows Update and Defender settings are just configured under Administrative Templates. This Windows 7 Firewall is very powerful indeed, and can be configured in a very in depth manner. 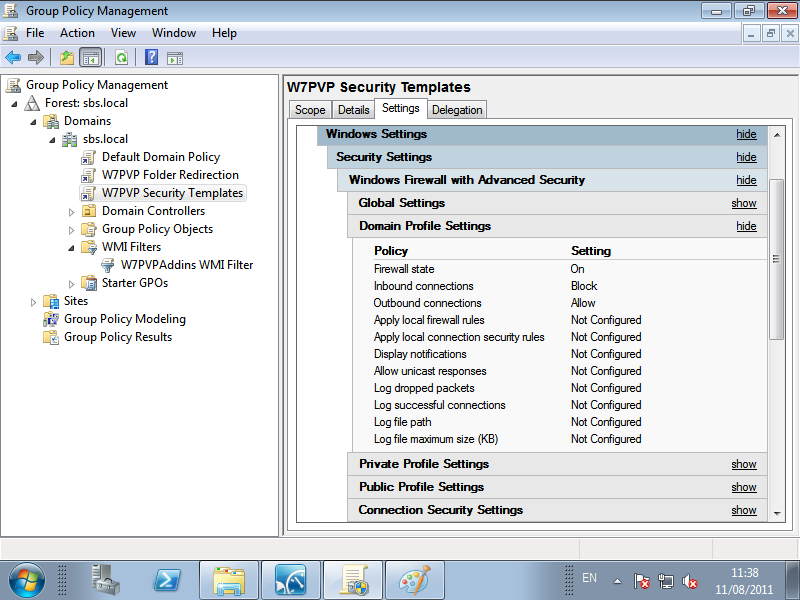 The W7PP does not go to such lengths and just applies some basic firewalling to the client computers. That is to say, it blocks all incoming traffic, and allows all outgoing traffic. It applies these settings on Domain, Private, and Public networks. Whilst i am security conscious I’m a little concerned that blocking incoming traffic whilst on the domain network might lead to having more issues that it solves, especially if Admins or Users in a small office are used to Sharing desktop printers or folders on each others machines. You could argue that the SBS Server is there to take over… but i am expecting people to trip up on this one. Anyway going back to the GPMC we can review the settings that are applied. That is it for the Windows Firewall settings. As i said, very basic settings. 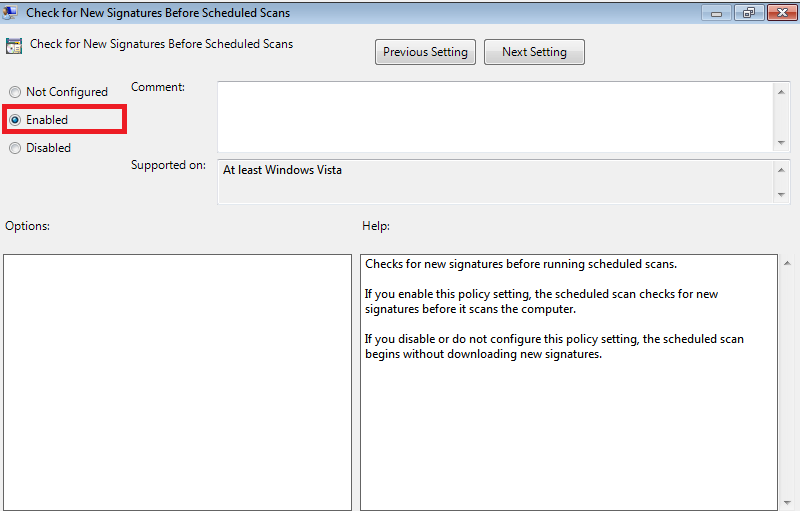 Check For New Signatures before Scheduled Scan This is fairly straight forward and, of course will force Windows Defender to check for updates prior to running a scan. There are other settings available for use by GPO. I cannot find a definitive resource bearing the Microsoft logo though, so, you’re on your own for now! Allow Automatic Updates immediate installation. This is a policy i always disable. It is enabled here by default, and this worries me slightly because an update that is downloaded that may not need to reboot will auto install. This could happen during the work day and i have seen it cause problems with clients. I have never used this setting since Windows XP days. Allow Non Administrators to Receive Notifications. 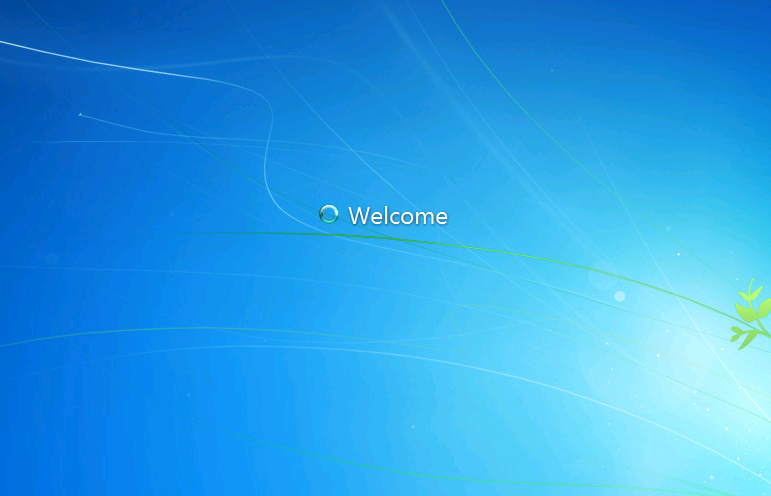 This will be the little prompt in the system tray that tells users Updates are ready. Personally i also do tend to turn this off, as prompts to users generally means questions, and we don’t like questions do we? 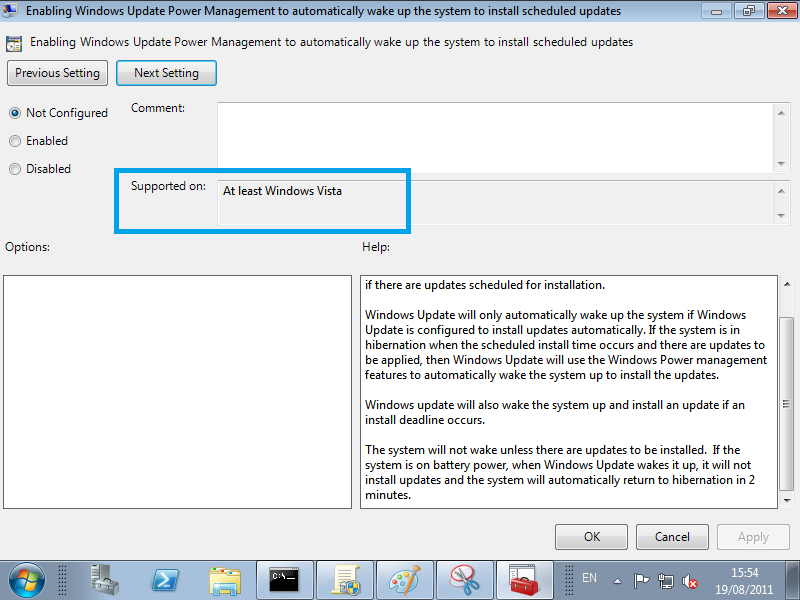 Enable Windows Update Power Management. A brilliant feature brought in with Windows Vista, Gone are they days when you had to leave your computer running overnight so it would actually install the updates at 3am. Windows can now switch on the machine for you and install updates, and let power management put it back to sleep when it is finished. Turn on Recommended updates. I don’t know what makes an update recommended as opposed to any other type. Suffice to say, by default, your going to get them. So that pretty much covers the installation, implementation, and settings on the Pro Pack. 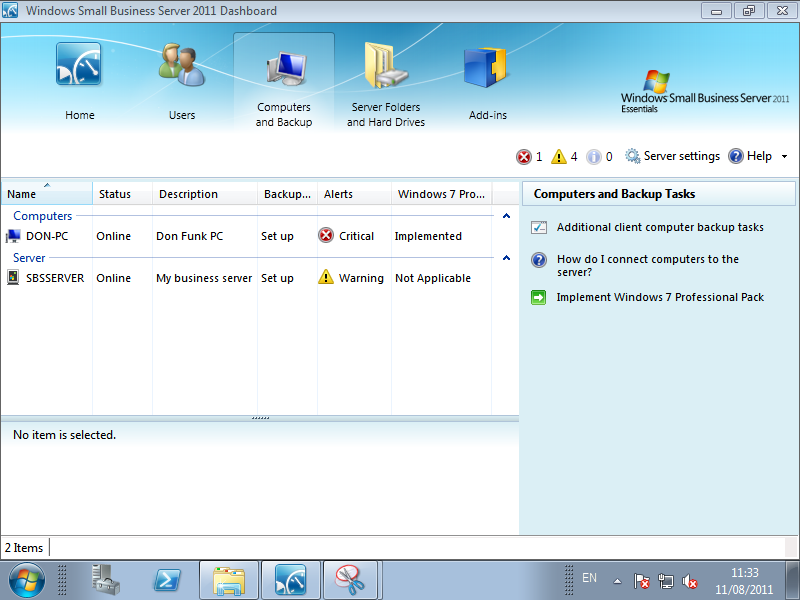 If we switch over to a Win7 Client PC now we can see some of the changes you will see on your machines. If you are new to GPO’s then one command you really want to learn is GPRESULT. This will show us the status of Group Policy on our client computer. Scrolling through the output, you will see, it is again split into Computer Settings and User Settings – almost like they knew we would be looking. We can see some really useful information about the Client, the last time it applied Group Policy, and the Server (Domain Controller) it was applied from, the Site we are in and whether we are using a Roaming Profile. Some of this is only for larger networks however and not really important in an SBS Essentials network. Moving down, we can see what policy is applied to our Computer, and which ones are filtered out. The same is true for the currently logged on User. We can see in this output the only policies that are being applied currently are the Default Domain Policy to the computer, and nothing to the user account. Lets also look at the path to our My Documents folder, if we click on Start, the right click Documents, and click Properties. 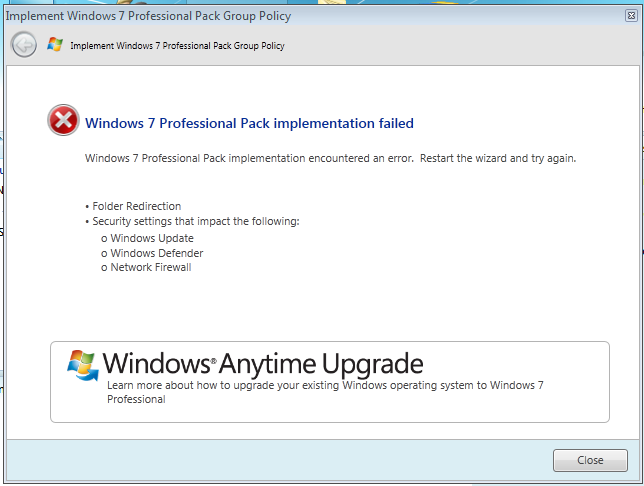 Now lets imagine we magically apply the W7PP, and reboot our PC. You may notice your first logon after implementing the pack is longer than usual, that is because the computer is copying up the contents of your redirected folders at logon. User wont know that though, they will just see a really slow logon. We can now see that our W7PVP Policies are applied. If we go back to look at the path of our My Documents folder, we can see that it now points to our FolderRedirection share on the server. 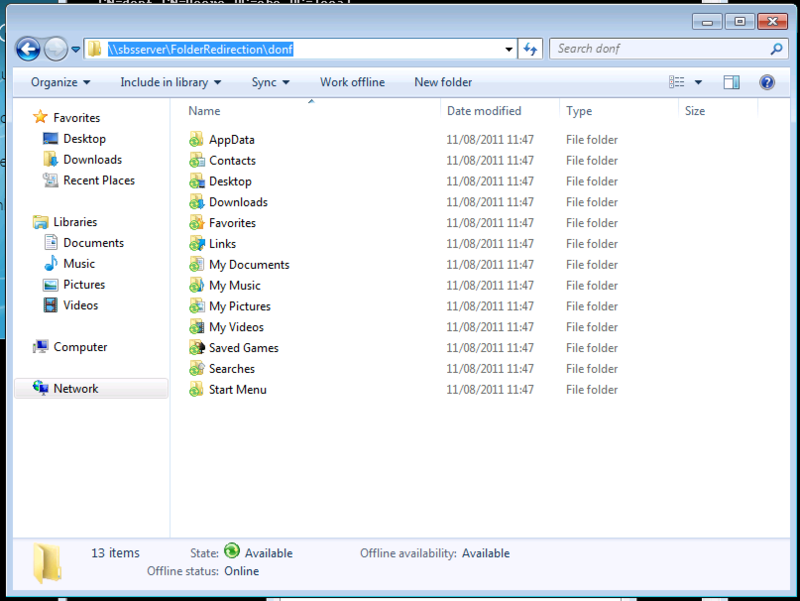 If we navigate to the shared folder we can see all of our redirected folders. We can also just review the status of the Firewall, right click the network icon in the system tray, then go to Network and Sharing Center, in the bottom left, click Windows Firewall. You can see a cream coloured bar saying that, For your security, Some Settings are managed by your System Administrator. During the writing of this post i did come across a few issues. Firstly, if you do not have a D:\ on your server and you choose to Redirect Folders, the implementation wizard will fail. You do not have the choice to move it to another drive, the wizard will just fail. What to do if you have built your server with one big C drive? NB. Do not use DISKPART unless you know what you are doing. You might think that is a stroke of genius. You’re right. Unfortunately it doesn’t work. Seemingly if you find yourself here you have strayed too far from the defaults and we know what means in SBS land.. you’re riding a segway on a cliff top, and we all know how that story ended right? 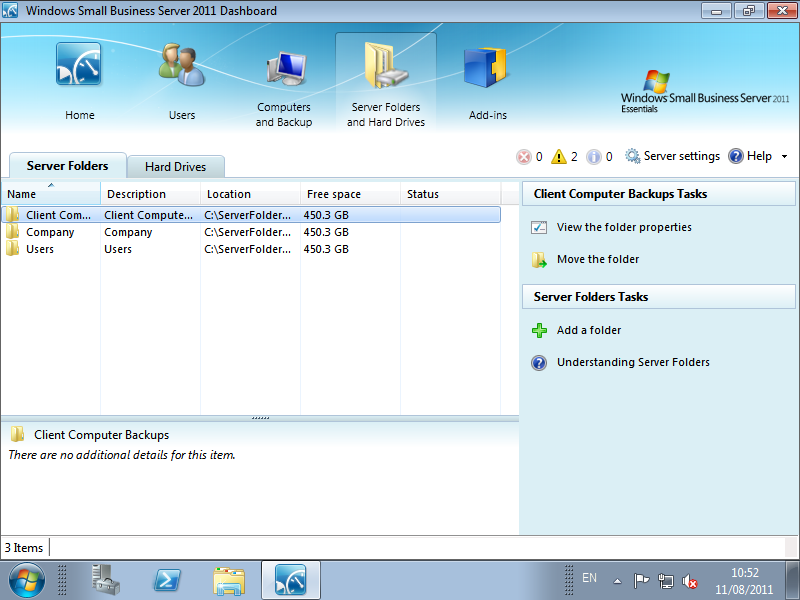 What does work however is Shrinking the C partition down and creating a new D partition in the free space. You can do this from Disk Management. Whatever happens, You need a D and the only way it seems, to get the wizard to play nice is to get a D:\, from wherever you can! Check your GPRESULT command, see what is and what is not applied. Look in the event logs on the client PC, you will find most errors with GPO are usually something simple like NTFS or Share Permissions. It shows all our users had no access! So how then, does Folder Redirection occur? 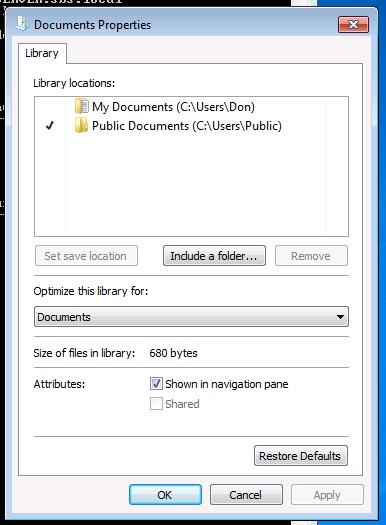 If we go into the Computer Management MSC console, we can look at the Share Permissions of the FolderRedirection folder. 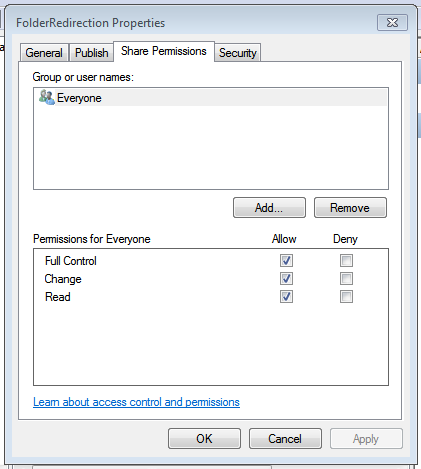 We can see here in the properties and on the Share Permissions tab, that Everyone has Full Control to the Share. 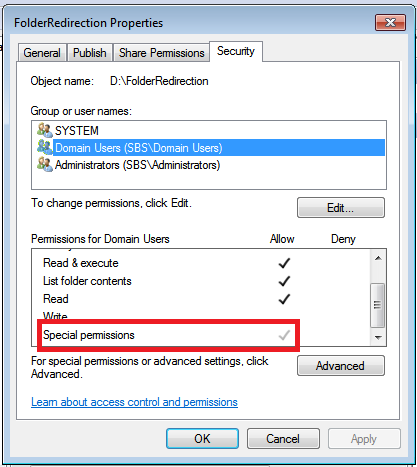 If we look at the Security tab at the NTFS permissions, we can see that Domain Users, have Read, Read & Execute and List folder Contents. We can also See a special permission is applied. That permission is create folders. 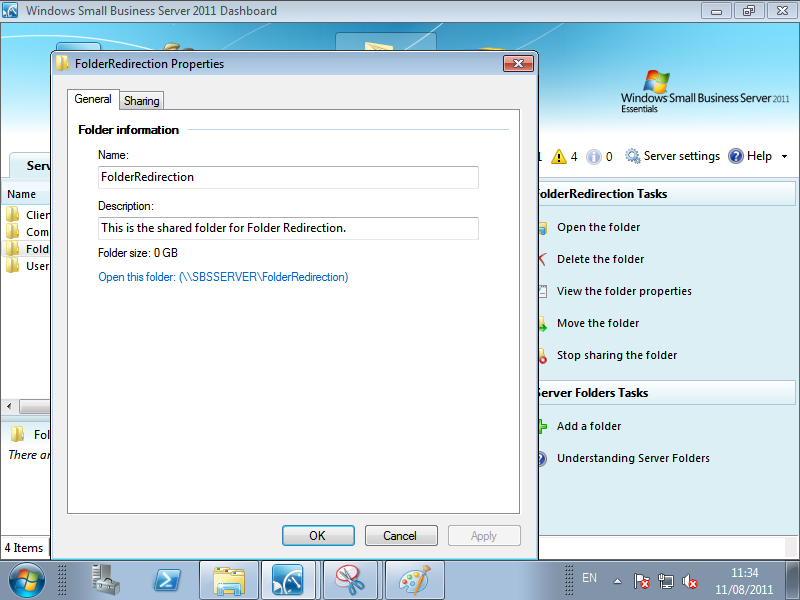 So, because our user has the Create Folder permission, we are allowed to create folders for Folder Redirection at logon. Then, because we created the folder, we are the owner, and the owner is granted Full Control of that folder by default. But why does it show ‘No Access’ in the Dashboard? Good Question. We don’t want that on the FolderRedirection folder as that potentially will grant access to other users folders once they have been redirected. I hope you have enjoyed this run through the W7PP, please form an orderly queue at the download center. 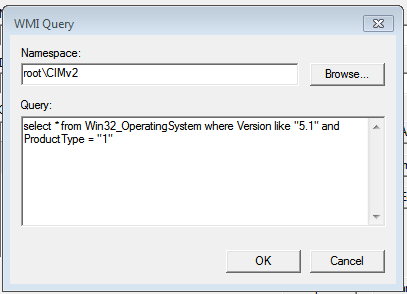 In this follow up post i talk about how to use GPO and WMI on Windows XP and Windows Vista to get similar functionality.